Guglie is on the Cannaregio Canal, just above the Grand Canal and north of the Ponte delle Guglie bridge. 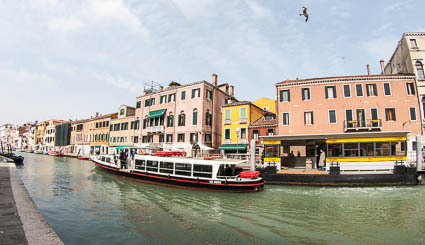 It's close to the Venetian Ghetto and within walking distance of the Venezia Santa Lucia Railroad Station. Boats headed in both directions stop at Guglie's single pontile or pier, so know which way you need to go before boarding a waterbus. Note: This station does not have a ticket booth or vending machine, so here's what to do if you need to board a water bus without a valid ticket or Tourist Travel Card.